In this elementary-level text, eminent Soviet mathematician A. Ya. Khinchin offers a superb introduction to the positive-integral elements of the theory of continued functions, a special algorithm that is one of the most important tools in analysis, probability theory, mechanics, and, especially, number theory. Presented in a clear, straightforward manner, the book comprises three major chapters: the properties of the apparatus, the representation of numbers by continued fractions and the measure theory of continued fractions. 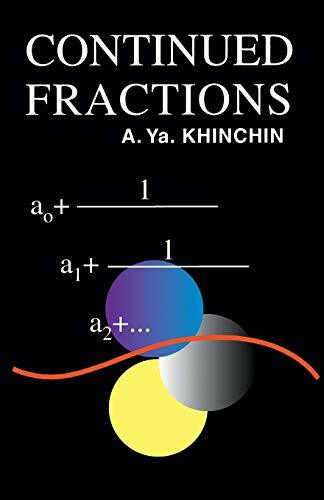 The last chapter is somewhat more advanced and deals with the metric, or probability, theory of continued fractions, an important field developed almost entirely by Soviet mathematicians, including Khinchin. The present volume reprints an English translation of the third Russian edition published in 1961. It is not only an excellent introduction to the study of continued fractions, but a stimulating consideration of the profound and interesting problems of the measure theory of numbers.